RALEIGH, N.C. (AP) — From the day Dave Doeren took over at North Carolina State, he knew he needed to find and develop bigger receivers. Now entering Doeren’s sixth season, the Wolfpack’s top receivers are all big-bodied targets with the ability to make contested catches. And with an NFL prospect in quarterback Ryan Finley, it’s easy to see why there’s so much optimism in Raleigh about the team’s potential to move the ball through the air. It doesn’t take long to spot the potential in the Wolfpack’s passing game, beyond Finley’s return for his senior season after flirting with entering the NFL draft after last season. First there’s Kelvin Harmon, a 6-foot-3, 214-pound junior who last year became the program’s first player since future NFL player Jerricho Cotchery in 2003. He had 69 catches for 1,017 yards and four touchdowns with six 100-yard games. Next is Meyers, a 6-2, 203-pound redshirt junior. The converted quarterback had 63 catches for 727 yards and four touchdowns, but was particularly strong down the stretch with at least 90 yards receiving or a TD catch in four of N.C. State’s last five games. That included a nine-catch, 105-yard effort against Atlantic Coast Conference champion Clemson. Then there’s Stephen Louis, a 6-2, 203-pound graduate as the third option and regular starter. Louis was the team’s fourth-leading receiver last year with 37 catches for 583 yards and two scores despite missing two games with an injury. This wasn’t the situation when Doeren arrived before the 2013 season. He said the coaching staff studied the rest of the league to determine the average heights and weights of each position group. It didn’t take long to figure out the Wolfpack just didn’t measure up at receiver. The focus became to bring in bigger prospects with length and speed, then have receivers coach George McDonald develop them over several years to turn them into tough players with the ability to make explosive plays and contested catches. The plan has worked, too. 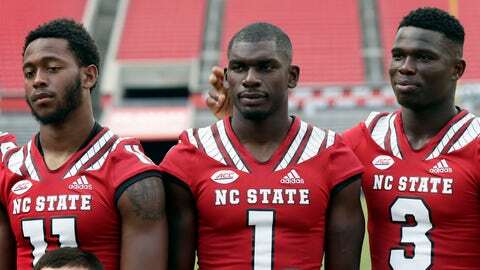 And the Wolfpack will need all three to have a big season. The offense lost 1,100-yard rusher Nyheim Hines to the NFL, as well as do-everything threat Jaylen Samuels — who had 16 rushing or receiving touchdowns last year to go with exiting as the program’s record holder with 202 career catches.